Is It Good? 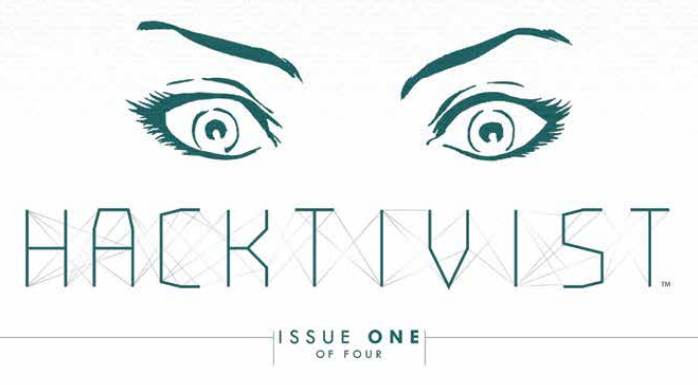 Hacktivist #1 Review – AiPT! Recently purchased by Boom! Studios, comic publisher Archaia is back in the monthly comics game with Hacktivist, a fast-paced cyber-thriller from the creative mind of…Alyssa Milano? Hmm…is it good? This issue opens in Tunisia where a professor is being saved by a badass chick (think Indiana Jones vibes) from a special ops team. They’ve been without internet for a while, but mysteriously get access right in the nick of time. They are saved by “sve_Urs3lf,” the largest white-hat hacking group on the planet. This same group is run by two men who run a new social media website by day. Oh, and they’re billionaires who hack systems to save the world in their free time. The basics of this premise are sound, but I’m not so sure after reading this issue. Introducing the hackers by showing close ups of them is inventive and interesting. The writing for these hackers is quite well done, which is good as far as this read is concerned since they take up so much of the book. Bookended by the female hero who opens the book, they take up much of the book with exposition and learning about their characters. Writers Jackson Lanzing and Collin Kelly do a good job fleshing these characters out and making them feel and unique. One is a billionaire with some social issues named Edwin. He sees their social media site as a stepping stone for bigger things, and also looks out his window analyzing busses and people who walk by to see patterns. The other is Nate who’s much more socially normal and appears to be a regular handsome dude with computer skills. They’re both young and rich with nothing to lose. Until now. Love the lettering to show it’s not in English. Much of this book spends its time explaining their social media site and at face value doesn’t seem much different than what we have now. The only difference is the data is saved on your own personal device seemingly to keep it safe. Of course, a page later these guys show they are capable of controlling the entire electrical grid of a city, so who’s to say anything is safe in their hands. What makes this site so impressive isn’t explained and what we do learn is expressed in some pretty heavy dialogue scenes. That weighs down the middle portion of the book, especially since we’re not told why we should care. The book eventually ends with call to action of our heroes that’s not very inspired or interesting, but one suspects there will be a spin on it come issue #2. The art by Marcus To does a good job keeping everything grounded in reality. It reminds me a lot of Pia Guerra’s work on Y: The Last Man with a bit more detail thrown in. The characters have a slightly rounded look to them that softens things. There isn’t too much action to speak of in this book, so it remains to be seen what To can do, but there is an epic two page spread showing the Tunisians rally that effectively shows the effect these hackers can have on the world. How did she see that? Not a bad introductory issue as far as characters are concerned, but I’m failing to see what the hubbub is with their concoction and extracurricular activities. There’s nothing here to gain perspective. That said, the characters are well fleshed out and should keep anyone’s interest as long as it holds up. The dynamic between the two hackers is fun and interesting. Want some real life espionage with hacker tendencies? Check this book out or a hacker you are not!